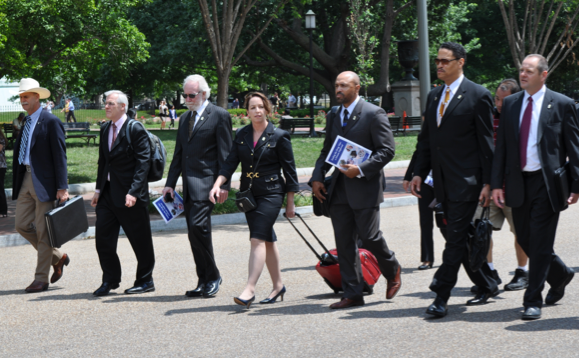 As we marched from the National Press Club over to the Office of National Drug Control Policy to deliver LEAP's report to the drug czar, many people on the street paused to stare. Who were these well-dressed men and women walking past the White House with a camera crew trailing behind? If they watched the evening news or read the paper the next morning, they now know the answer. They are police, prosecutors, and prison wardens working to end the War on Drugs and they couldn't possibly have expected their message this week to reverberate any louder than it has. They are the definition of credibility in the drug war debate, and it is literally impossible to possess an informed opinion on these issues until you've carefully considered the concerns of these professionals and contemplated the solutions they propose. That's why it's just such a shame – and really quite revealing – that the Drug Czar didn't invite them in when they arrived at his office to present the findings of LEAP's report. I know why I wasn't let in (I've written like 900 things condemning various drug czars for an exhausting array of outrages emerging from that office and wouldn't have stepped inside even if they let me, lest I might never be seen or heard from again). But I was just there to observe. With us on Tuesday was Norm Stamper, who served as Police Chief of Seattle immediately prior to Drug Czar Gil Kerlikowske. Their professional credentials are so remarkably similar, yet one relies on his vast experience to work towards fixing fundamental flaws in our drug policy, while the other cowers in his ivory tower in Washington, D.C. as he endeavors desperately to defend decades of unmitigated waste and destruction. We'll see who history remembers as a champion of justice. Our image posting system doesn't seem to allow a long enough caption to identify all of the LEAP marchers pictured above. Here is the rest of the caption, courtesy Eric Sterling: From Left, Howard Wooldridge, Executive Director, Citizens Opposing Prohibition (retired detective, Bath Township, Michigan); Eric E. Sterling, President, Criminal Justice Policy Foundation (former assistant counsel, Subcommittee on Crime, U.S. House of Representatives); Norman Stamper, LEAP (former Chief of Police, Seattle, WA, author of Breaking Rank); Leigh Maddox, Special Assistant State's Attorney, Baltimore City, MD, Adjunct Professor, University of Maryland School of Law, (former Captain, Maryland State Police); Neill Franklin, Executive Director, LEAP (former Major, Maryland State Police and Baltimore City Police); Matthew Fogg, LEAP, (former Chief Deputy U.S. Marshal); Richard Van Wickler, Superintendent of Corrections, Cheshire County, Stoddard, New Hampshire; (not shown, Terry Nelson, former supervisor, U.S. Department of Homeland Security). Join The Wire's Sonja Sohn, the Reverend Al Sharpton (tentative) and elected officials at an unprecedented press conference to call attention to the failures of the drug war and to propose new solutions. This week marks the 40th Anniversary of President Nixon declaring a war on drugs. A trillion dollars and millions of ruined lives later, the war on drugs has proven to be a catastrophic failure. It’s time for a new direction. Sonja Sohn, actress from acclaimed HBO Series "The Wire"
Guests should arrive at the 6th Street entrance of the Newseum. There will be a table with a Drug Policy Alliance tablecloth just inside where someone will greet you and check you in. There is an elevator nearby that will take you to the 3rd Level, where the studio is located. Someone will be just outside the elevator to help direct you to the studio space. We are using the Knight Studio that is on the C Street side of the building, not the Pennsylvania Ave side. *Tentatively confirmed either in person or live via videoconference. The Newseum, Knight Studio A, 555 Pennsylvania Ave., N.W. Come join fellow activist-students from across the east coast as we enjoy a weekend of camping, friends and fun in a beautiful and friendly campground. Just 90 minutes from New York City and 4 hours from Boston and Washington, DC, Cedar Rapids is a beautiful, privately owned campground along the banks of the Delaware River in Lower New York State. • Showers and real toilets available. • Weekend fishing licenses available. The raft price includes a spot on an 8-person boat with a cooler on-board. They drive us up the river and we slowly cruise back to the campsite on mild class II rapids. Rafting fee may be paid on-site the day of the trip. CASH ONLY. You must RSVP with your camping fee paid in full by 5:00pm EST, Wednesday July 13th to reserve your spot. Contact Victor Pinho or Stacia Cosner with any questions. Cedar Rapids Kayak & Canoe Outfitters at Cedar Rapids Inn is located 18 miles north of Port Jervis, New York on Route 97N. The International Drug Policy Reform Conference is a biennial event that brings together people from around the world who believe that the war on drugs is doing more harm than good. It brings together over 1,000 attendees representing 30 different countries. The 2011 Reform Conference is taking place in Los Angeles, California from Wednesday, November 2 through Saturday, November 5 at The Westin Bonaventure. Visit http://www.reformconference.org for further information -- registration info is available here and scholarship info (due date June 30th!) is online here. Organizations interested in being involved with the conference can find information on sponsoring, exhibiting or partnering here. Marijuana businesses looking for help navigating the federal tax code are watching a congressional proposal sponsored by Colorado Rep. Jared Polis. Polis and other House members introduced legislation about medical marijuana. One of the bills would allow marijuana-related businesses to claim business deductions on their federal taxes. Currently the IRS does not permit marijuana-related business to claim business deductions.